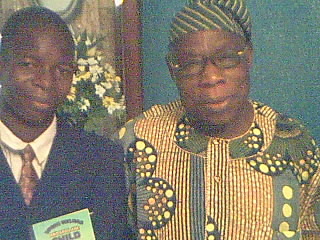 It was just like yesterday; though exactly six years today, I can vividly recall those words spoken (and written) to me by the former Nigerian President, Olusegun Obasanjo. He gave me the children and youth versions of his book ‘I See Hope’ and said “I am sure they would further encourage you to go for gold“. Those words and the gifts (children and youth version of ‘I See Hope’) have over the years been appreciated. To our generation and other patriots of our country and continent; I say to you -once again- today that I SEE HOPE. I see hope in the intellectual development of our citizenry, who in turn contribute to the development of our society and country. I see hope in the educational sector providing qualitative education to Nigerians – to aid young people in learning and living (not just existing). I see hope in an enabling environment that promotes values and ethical reasoning, and integrally encourages/promotes active participation of young people in building a better world. I see hope in a Nigeria, where social, ethnic and religious divide is a thing of the past and we relate based on the content of our character. I see hope in a Nigeria, built consciously by Nigerians.